The 2018 gubernatorial election provides an opportunity to elect a governor who prioritizes young children and families through public policies and public investments. 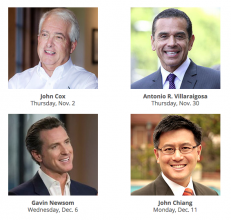 Silicon Valley Community Foundation and its Center for Early Learning are hosting moderated discussions with major candidates for governor. This series will help local philanthropists, educators, government officials and child advocates learn about each candidate’s stances and policies on young children and families, as well as other pressing issues in Silicon Valley. This series is part of Choose Children 2018, a two-year, nonpartisan campaign that seeks to ensure the next governor of California is a champion for children. For more information and to register for a forum, see the Silicon Valley Community Foundation website.